Anne Hathaway has a warmth problem. For some reason, many viewers – even some who call themselves fans – find Hathaway to be cold, robotic, fake, and even inhuman. I’ve never quite gotten this impression myself, but I have noticed her choices lately tend to paint her as a sympathetic “every girl.” From her Oscar winning role as the dying young mother Fantine in Les Miserables to her turn as the damaged but driven astronaut in Interstellar even to her hilarious performance on Lip Sync Battle against her bestie/The Devil Wears Prada co-star Emily Blunt – it all seems calculated (Oh. I bet they were hoping no one noticed. Oops.) to reframe the actress as a girl you’d like to hang out with, someone you can relate to. 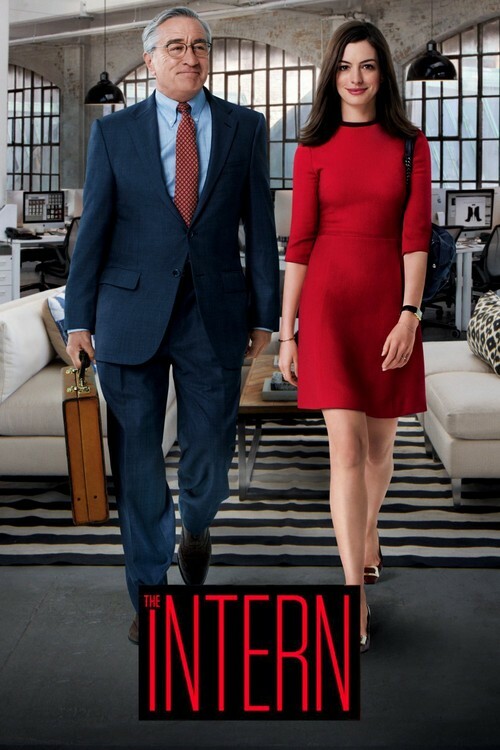 With The Intern she plays the endgame/spiritual sequel of her Prada character and tries to bring the warmth the she so desperately needs to show. Step 1 for business success: Power Walking! Hathaway’s character, Jules, is a driven if scattered CEO of a clothing startup. We’re told repeatedly how smart she is and how she started the company all by herself. She’s so busy running the company – filled with the types of 20-something slacker stereotypes that somehow hasn’t become tiresome yet – that she frequently forgets things. Things like agreeing to start a Senior intern program, brining seniors into the company to impart their wisdom in business. Robert De Niro plays the titular intern, Ben, a widower who just wants some way to pass the days and feel useful. It goes without saying that they work together and teach each other many valuable lessons over the course of the film. Not to be cynical, but I knew what this movie was from the first trailer I saw. Funny, heartwarming, inspiring, and imparting valuable lessons about what the lessons the older generations can teach if just given the chance. All of the writing was on the wall. What wasn’t telegraphed in the ads, though, was how incredibly charming the whole thing is. De Niro is delightful in this role of a nurturing, but never condescending father figure. His chemistry with Hathaway is instant (hell, his chemistry with the entire cast is instant) and he is a joy to watch in each scene. The younger actors, specifically comics Adam Devine and Anders Holm, hold more than their own with the vets. Holm particularly plays the drama of an 11th hour unnecessary plot twist with a real emotional depth. It’s great to see actors that are normally pigeon-holed in one genre stretch into others and excel, and Holm really takes a minor role and runs with it. But it’s Hathaway who really does the most in this movie. She plays every possible emotion beautifully and really hit all the right notes. Despite the backlash against her she continually proves why she is considered a great actress. And, if this film is part of her “show some warmth tour” (he says cynically) then it more than accomplishes its goals. That said, there are problems, the plot contrivances come fast and furious. Many come totally out of nowhere and serve to really add nothing to the narrative. The directing seems designed to throw you off the track of where the film is going, alluding to potentially dark turns which disappear and other red herrings that a movie like this just doesn’t need. This is a comedy, quite why it’s structured to keep the audience guessing is beyond me. I like your review style, Geek of Critique. Very authentic :). Would love to feature your reviews in our weekly curated email digest that goes out to thousands of people. Wow, thank you. I would love more information about that.